Spiritual practices of peacemaking, Michael Battle says, are essential to, crucial for, the mystical process of losing and finding identity in God who constantly invites us toward relationship and community. 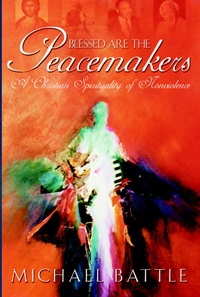 Any spirituality of nonviolence in the community of peacemaking faces formidable challenges. The obvious obstacle of 'just war'–just one corollary of the constant struggle for survival in a world seemingly bent on self-destruction–continues to raise its ugly head. And what of other loud pretenders of Christian 'spirituality' who preach the validity of 'just war,' the at-any-cost survival of the 'righteous'? Genuine Christian 'spirituality', Battle rightly insists, involves no contradiction between individual and communal fulfillment, but involves instead our participation in the divine bending toward potentiality rather than destruction. Violence, that is, destruction of reality, is in fact the antithesis of Christian spirituality. Christian spirituality, practiced in the midst of a solipsistic and violent world, engenders divine reality that bids the human heart toward peace, genuine wholeness, and toward the 'real' world of divine intent.